So, instead, I bring you an update on the things I do when other people are telling stories around a bonfire. I knit. In fact, my scariest campfire story goes something like this: “And then…when she was about five inches short while binding off the incredibly complex shawl that she’d been knitting out of hand-spun yarn for three months…the ball ran out…” Gasp! Horror! Yes. It happens. And those of us who knit all feel the pain. Because my neck will be warm when the shivers go down everyone else’s spines. 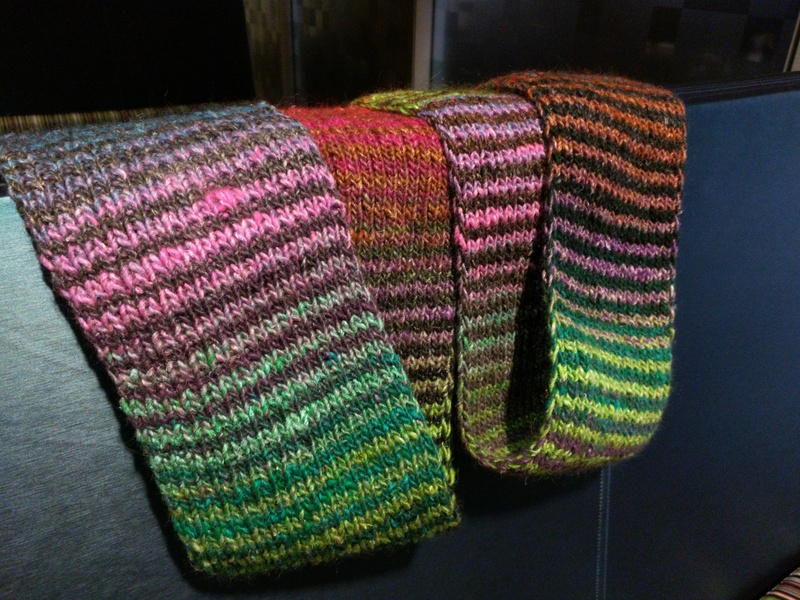 I finished a Noro 2-row scarf for myself! Yes, this one is for me and me alone. No sharesies. I’ve made at least 3 others, and they have gone to my brother-in-law, my Husbeast, and our friend C. This one is mine. It has lots and lots of pink in it. I’m also knitting a pair of socks. 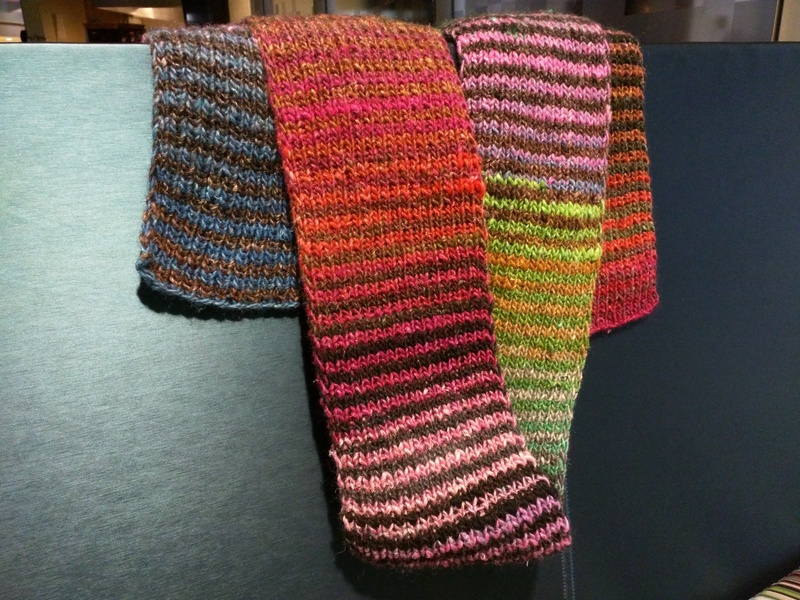 You can (currently) disregard anything in the right-hand sidebar from Ravelry that says I’m knitting anything BUT these socks, because they’re really all I’m knitting on right now. I don’t have the brain power at this time to work on anything more difficult or patterned. I couldn’t tell you what yarn this is as I’ve lost the ball band (likely something akin to Trekking), but I’m enjoying the way it’s striping. These are going to be toe-up with a Fleegle Heel. O hey! I don’t like camping either but I envy those who can knit. I’ve been looking for someone to knit me a pair of slippers because I can’t knit and I haven’t the patience for it but I find knitted slippers so comfortable. I don’t mean to be intrusive but if you wanted to knit a pair of these slippers I would pay you .. Tha pattern cost 2 dollars so you can charge me for a reasonable price . Unfortunately, when it comes to knitting, I have a list as long as my arm that needs to be completed and never enough time to finish it. When you’re a knitter, winter is *always* coming. For me, it’s knitting for my family. I have a bunch of work to get done before Yule. I know you say that you haven’t the patience for it, but knitting is very easy and relaxing. Some doctors even suggest it for folks with high blood pressure! 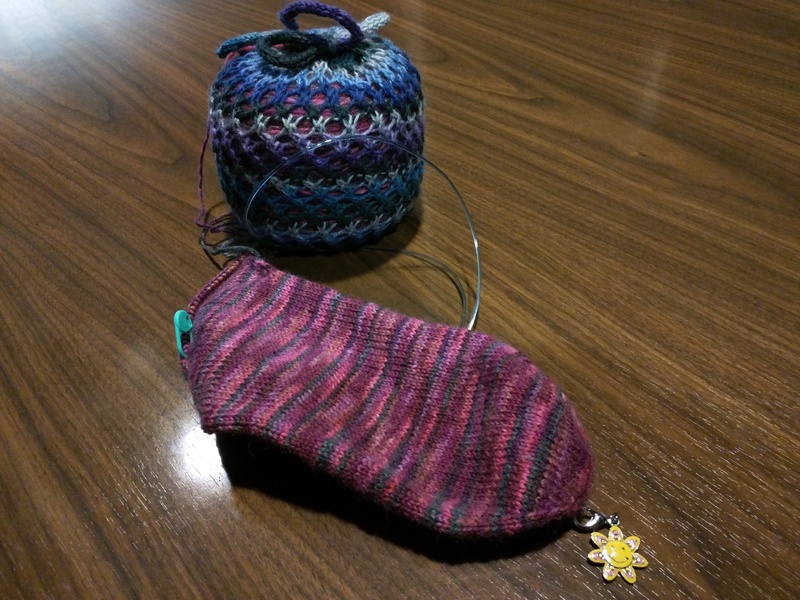 Once you figure out how to knit and purl, it’s really just a matter of practice. If you’re a TV-watcher, finding time is easy — most of us knit while we watch/listen. Finding yarn you like to touch & the right needles for you (straight or circular) helps.